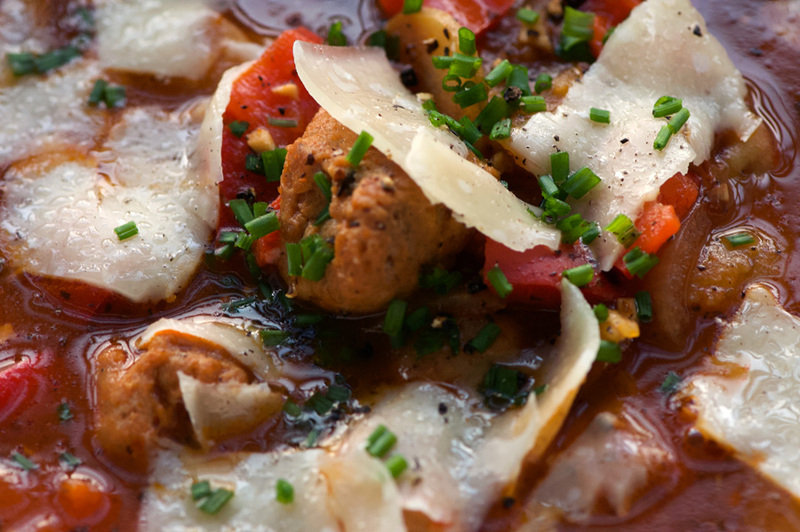 A hearty meal with a healthy dose of veggies, this Italian Potato-Sausage Soup is one of the first recipes I ever made. I remember the first time I tried it, I confused a clove of garlic with a head of garlic, so I used 2 whole heads of garlic by mistake! The result, while rather pungent, actually wasn’t half bad 🙂 I learned my lesson for next time and it’s been a favourite dish for over twenty years now! 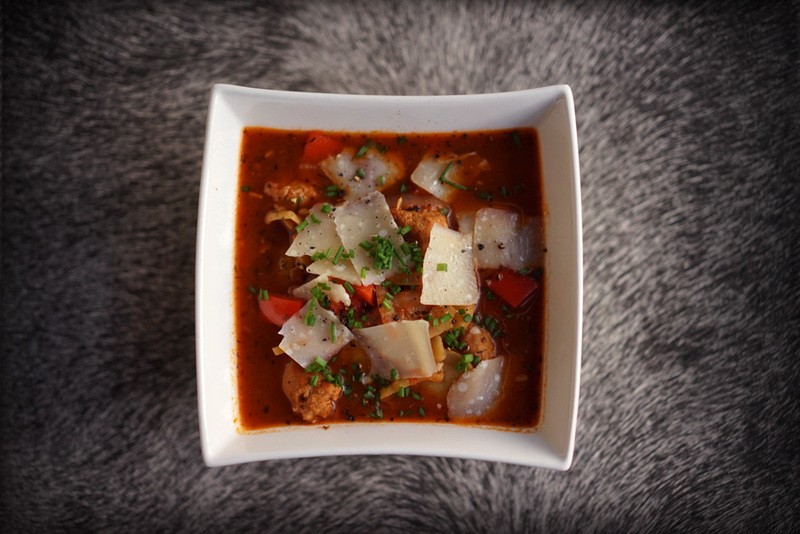 The sausages give the broth a wonderful spicy flavour complimented by the fresh red peppers. Topped with shaved Parmesan cheese and some chives, it comes together quickly for a delicious lunch or dinner. The original recipe came from a book I had picked up, 30-minute Meals from the Academy. An oldie but a goodie, this book has lots of simple recipes that are easy to pull together and taste great. 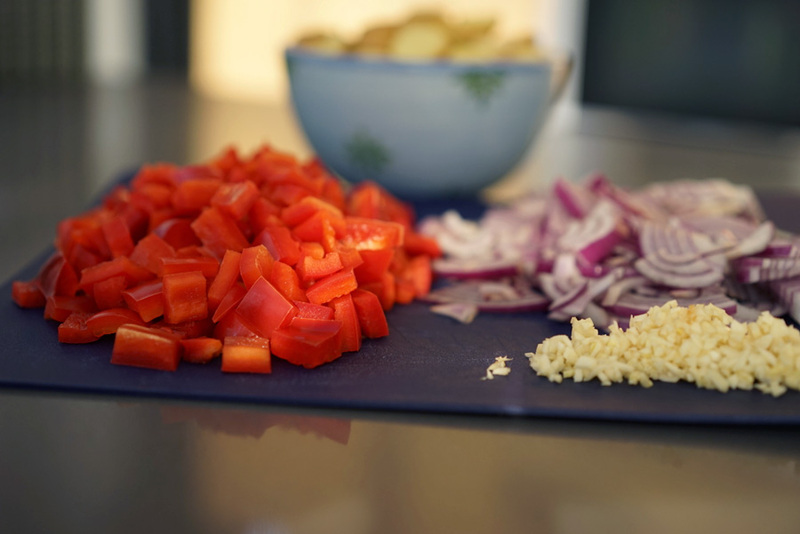 The book put an emphasis on the mise-en-place method of prepping and cutting all of your ingredients before beginning to cook anything. This was an important lesson to learn when I first starting out—I still remember frantically trying to keep up with prepping ingredients while cooking because I hadn’t thought through how long the prep work would take (and being a newbie in the kitchen, I wasn’t exactly sous chef material!) True to the book, I still prep and chop everything for this recipe before getting started on the stove. It’s worth noting that the quality of sausages you buy will greatly affect the final dish. Rather than the basic grocery store sausages that can be very fatty and overly salted, I go to a good quality butcher offering house made, smaller-batch sausages instead. I find they tend to be much leaner and the spices and overall flavour is so much better. They freeze well, so you can always buy enough for several recipes to avoid too many special trips to the meat shop. I adapted the recipe to include the extra step of removing the sausage casings. It only takes a couple of extra minutes and makes the sausage pieces more meatball like. I also found that while the larger piece sizes recommended for the veggies look quite gourmet, they are hard to manage and not very user-friendly while eating. Instead I go with bite-size pieces that fit easily into a spoon—no extra cutting/wrangling required while eating! The sausages start off steaming in a small amount of water, then the water is drained and they are browned on all sides. Once brown, the sausages are removed from the pot and set aside. Olive oil is added, and the veggies are sautéed. I start with the onion, followed by garlic, seasoning and potatoes. I add the red peppers near the end as I like them to remain just a tiny bit crisp. Once the veggies are just slightly golden in places, it’s time to add the broth and tomato paste. The reserved sausages go back in, too. At this point you just need to cook everything for about 15 minutes or so, until the potatoes are soft and cooked through. Do a taste check for salt and pepper, adding more if needed. A nice crusty baguette with butter on the side round this out for a tasty dinner or hearty lunch. To serve, ladle into bowls and top with shaved parmesan pieces and some chives or green onions. Twenty years later, I still make this regularly and it’s a real crowd pleaser. This recipe is a keeper and I hope to make it for another twenty years. 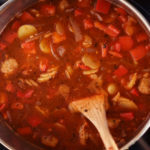 A hearty soup loaded with bright red peppers, garlic, potatoes and sausage that is quick and easy to make. Trim, chop and prep all ingredients. 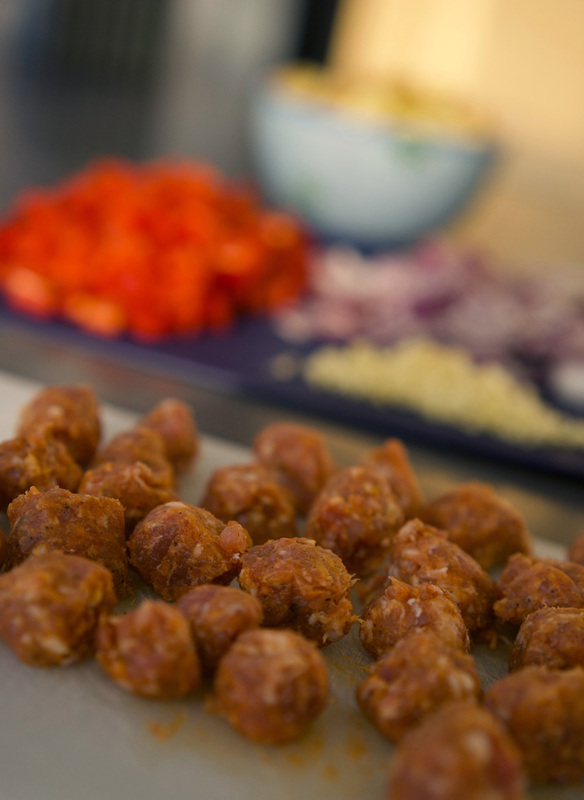 Remove casings from sausages and cut into 1" pieces, forming little sausage meatballs. 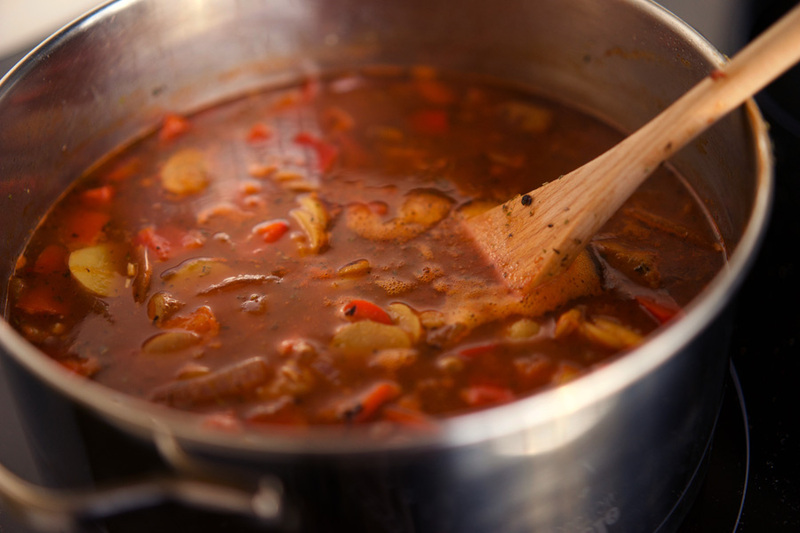 In a large covered pot over medium-high heat, simmer sausages in 1/4 cup water for four minutes. Drain water, increase heat, and brown sausages on all sides (for about five minutes). Remove sausages and set aside. Heat olive oil in pot. Add onions and sauté for four minutes. Add garlic, potatoes, Italian seasoning and salt and pepper to taste. Cook for another five minutes. Add red peppers and cook for two minutes. Add tomato paste, broth and reserved sausages. 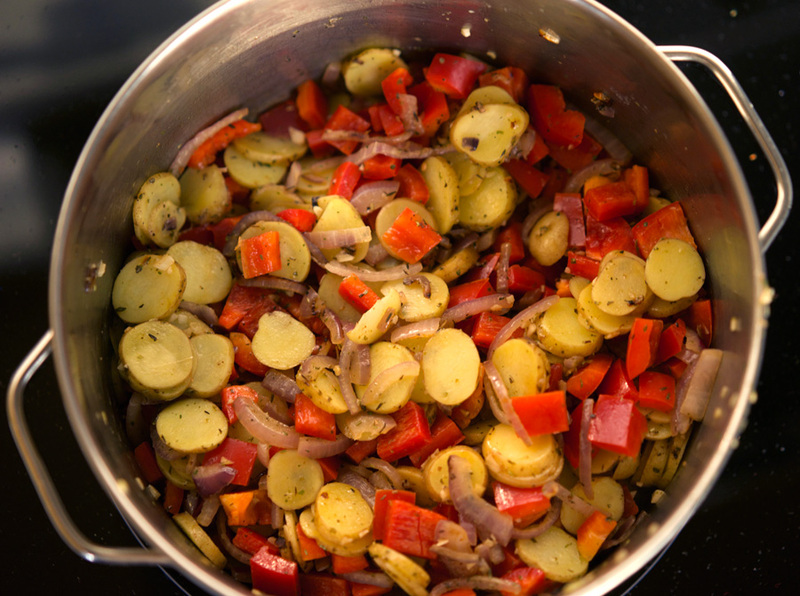 Bring to a boil and simmer for fifteen minutes, until potatoes are softened and cooked through. Test for seasoning and add more salt if needed. To serve, ladle into bowls and top with shaved Parmesan, freshly ground pepper and diced chives.